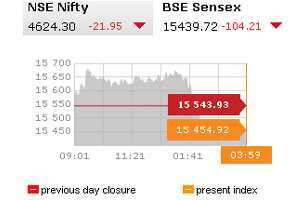 New Delhi: Shares closed 0.6% lower on Friday and posted their first annual fall in three years as a combination of near double-digit inflation, high interest rates, slowing domestic growth and policy inaction turned off investors already shaken by global headwinds. Foreign fund inflows, a major driver of Indian stocks, dried up in the dismal year with net outflows of about $380 million as of Wednesday, a far cry from record inflows of more than $29 billion in 2010 that had powered a 17% rise in the benchmark index, following an 81% surge in 2009. The benchmark’s fall in 2011 was only the second annual decline in a decade. The Indian benchmark index currently trades at about 13.6 times one-year forward earnings, Thomson Reuters data showed, down from 20 times in January this year. “The way things are, it (2012) looks uncertain," said Srividhya Rajesh, an equity fund manager at Sundaram Mutual Fund. “Going forward, the positive catalyst should come from the expected cooling off in interest rates, but to sustain the momentum, the government also needs to ensure its long-term reform programmes are on track." The 30-share main index ended down 0.57% at 15,454.92 on Friday, with 22 components closing in the red, having risen as much as 1% in early trade. The index fell 4.1% in December, it’s second straight monthly fall. For the quarter, it was down 6.1%, posting its fourth straight quarter of losses. By comparison, the MSCI all-country world stock index has lost nearly 10% in 2011 and the MSCI Emerging Markets Index has fallen about a fifth. RBI kept rates unchanged at a review this month after raising them 13 times since March 2010 to control stubbornly high inflation that has stayed above 9% for a year through November. The country’s coalition government, struggling with a series of corruption scandals and Parliament gridlock, has been slow to bring policy reforms, vital for the economy’s growth. Earlier this month, it suspended plans to open India’s $450 billion supermarket sector to foreign firms such as Wal-Mart Stores Inc, backtracking from one of the boldest reforms in years in the face of a huge political backlash. Adding to the woes, the local rupee currency is down 16% this year, making it the worst performer among major Asian currencies this year. “The domestic micros are suggesting that there will be some amount of revival for sure, but what is not clear at least in the first quarter of next year is the outlook on currency," said Deven Choksey, chief executive at brokerage K.R. Choksey. “If the rupee stays stable, then things should be looking better." The main stock index is seen rising to 18,000 points by mid-2012 and to 19,250 points by the end of next year, a Reuters poll conducted in late November showed. The wider 50-share NSE Nifty index fell 0.47% on the year. Consumer stocks Hindustan Unilever and ITC Ltd, which are usually seen as safer bets in a volatile market, were the best performers in the Nifty index, rising about 30% and 15%, respectively. Billionaire Anil Ambani’s Reliance Infrastructure and state-run steelmaker Steel Authority of India fell about 60% and 55%, respectively, to be the worst performers in the Nifty index. Lingering worries over euro zone sovereign debt crisis have caused wide-spread investor risk aversion for most part of this year. • Top software services exporter Tata Consultancy Services unseated energy giant Reliance Industries to become the most-valuable company at $42.7 billion. TCS shares are little changed on the year. • Shares in Reliance Industries lost nearly 35% in 2011, with concerns including slowing gas output at one of its key fields weighing on investors. • Top lender State Bank of India closed 0.6% down, after rising as much as 1.3% earlier in the day. The state-run lender expects the government to inject capital “any time" although it is yet to get a formal commitment on the amount, a senior official said on Friday.